No man can succeed alone and no woman can be happy herself. We need each other. Just like this famous proverb says... "For every successful man, there is always a woman." And I have to add on, "For every contented woman, there ought to have a successful man behind." I always encouraged all ladies and their men to assist each other. 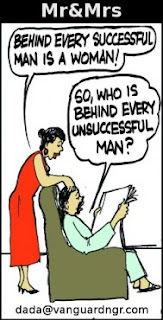 So who is the rightful woman who could help her man to be successful. Is simple yet is so difficult. The woman who could support her man to excel in life, is one who could inspire him with love and afffection. The inspiration comes with constant motivation and encouragement for her man. By himself, he might easily give up his desire and dreams. By himself, frustration could lead him to failure. By himself, he could not see the inner thought. By himself, most obstacles and problems could be difficult to solve. The beauty of the woman he loves is different. Cause the charm and tenderness of love from this special woman could brighten an upset mind, and the sweet and inspiring words could motivate his desire to move again. No other person is willing to offer this assistance constantly, except the woman who truly loves him without condition. Yes! As I said earlier, is simple yet so difficult because where to get this special woman! And that's the reason most men find it difficult to attain success in their lives. For the gentlemen. In case if you have the woman now, be fair to her. Love her madly and be sincere with your love. Never take her for granted and treasure her like a diamond. Cause at the end, she would lead you to achieve success and happiness. BUT remember... "Behind every successful man is his woman. Behind the fall of a successful man is usually another woman too." I'm always on top of the world, especially having you around again.